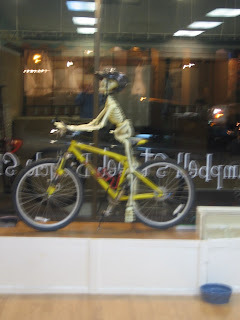 Campbell Street Bicycle Shop: Scary! Its a day late but here is a picture of my friend Scott's wife's bike, (it's for sale) and our new friend and loyal employee Scully. We set him up for halloween, and got a fair number of interested looks. Also in the background you can see our new window lettering, and our beutiful new flooring. It's Bamboo which is about the most enviromentaly sound floor we could find that looked nice. from what I can see, the window lettering looks great, and um, how did you come up with a skeleton? Just dont let any Panda Bears in your shop to eat the flooring!! !